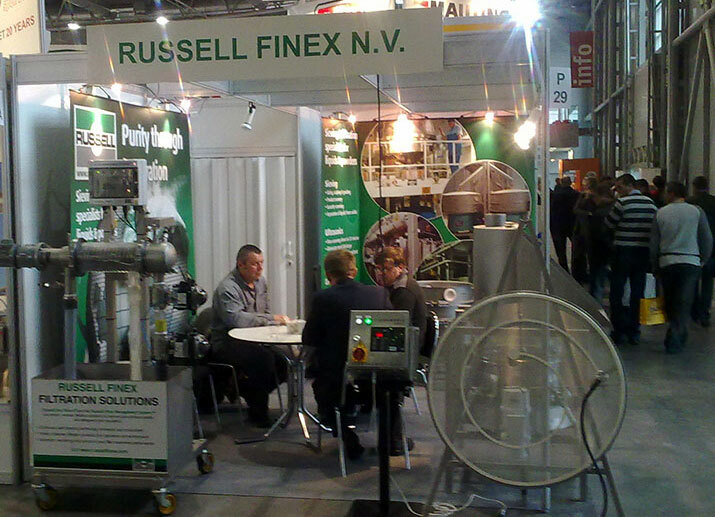 Russell Finex recently exhibited at Salima, the most important food technology trade fair in Central Europe. The show combined four shows, creating an extensive platform for food producers, distributors and sales representatives and proved once again to be a great success, attracting more than 28,000 visitors and with an increase of 15% in the number of exhibitors compared to the last show. The trade fair also expanded its international allure with almost 48% of companies coming from abroad and for the first time welcoming exhibitors from Kazakhstan, Morocco and Vietnam. Russell Finex were very pleased with this year’s edition of the Salima trade show as it has brought new and interesting business opportunities and strengthened long-term business relations. At the show Russell Finex welcomed visitors from across the world onto their stand who were attracted to the working demonstration of the Self-Cleaning Russell Eco Filter®. Visitors could see how the unique SpiroKlene™ wiper system continuously cleans the inside of the re-usable stainless steel filter element. The machine was also installed with the Filter Management System™ which continuously monitors the filtration process and automates the oversize discharge. Also shown on the stand was the Russell Superclamp™ (patent pending), a newly developed quick release clamp which provides a consistent and uniform clamping pressure. The clamp does not need re-adjusting and therefore increases the life of seals, gaskets and clamp pads. Other benefits include minimized damage to sieve decks of vibrating screeners, increased life of your sieve and fewer clamp replacements. The Salima trade fair is the most important exhibition for the food processing industry in the Czech Republic and the Central European region. The show is a platform for producers, distributors and sales representatives to discuss and discover the latest innovations and developments in the industry. The next edition of the international food technology fair Salima will be held from 1st to 4th March 2016 in Brno, Czech Republic.